Libyan rebels have entered the town of Zlitan after a weekend of heavy fighting in which Nato escalated its bombing campaign in the runup to the Muslim holy month of Ramadan. RAF planes dropped 16 Paveway laser-guided bombs in two days around the town, destroying government tanks, rocket launchers, ammunition dumps and command centres, and clearing a path for the rebels. The Ministry of Defence said RAF jets also attacked a railway construction site at Bani Walid, south-west of Zlitan, commandeered for use as a military fuel distribution facility. Opposition fighters said the town, which they have struggled to capture for eight weeks, was quiet on Monday, with no sign of government troops. 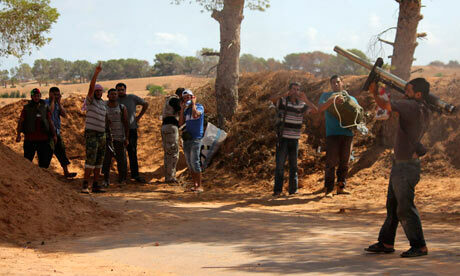 We are in the town centre and we have the hospital," said rebel fighter Yunus Al-Haq. "It's good for the spirit." 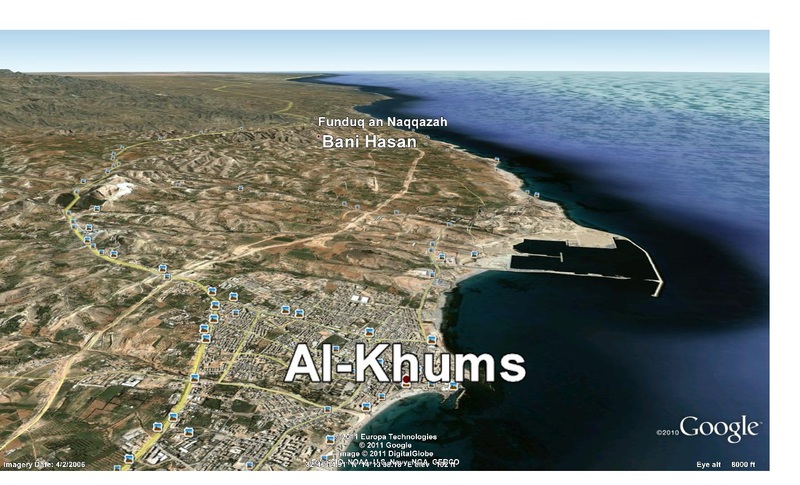 But securing the town for the opposition depends on clearing one final obstacle – agreement from the elders of the town's Fowater tribe that Misratan fighters can be "invited" to occupy Zlitan. 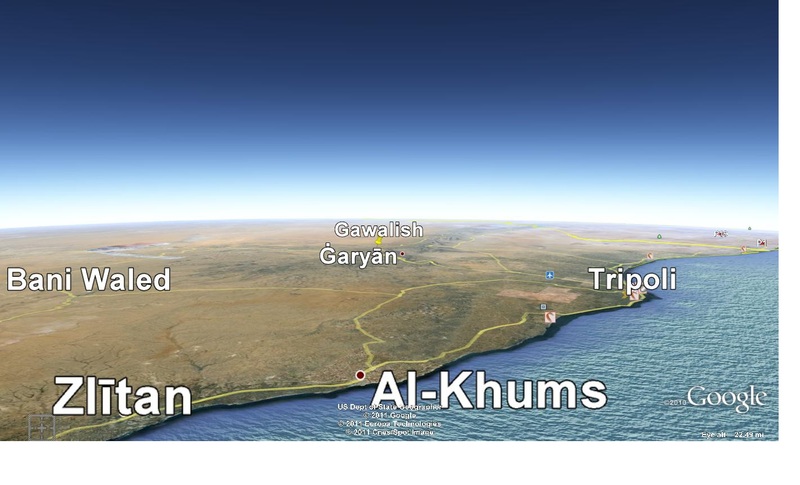 After that, rebel commanders expect government forces to pull back to Al Khums, 22 miles to the west. Despite the capture of tanks and heavy artillery over the weekend, rebel units are too lightly armed to contemplate a headlong rush to Tripoli. They have evolved a strategy of pressing against government lines, forcing Muammar Gaddafi to deploy forces in concentrations that provide inviting targets for Nato. 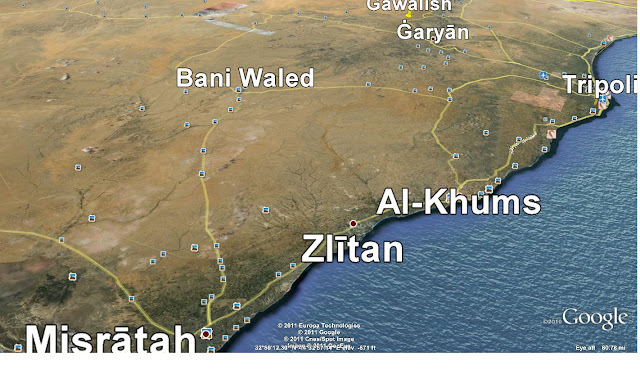 Nato bombing returns show that 54 military targets around Zlitan were destroyed since 25 July, one of the heaviest bombing concentrations of the war. The bombing appears to have caused government lines to crumble over the week, with rebels reporting that loyalist troops offered little resistance to their advance. Forty government troops gave themselves up on Sunday in the biggest one-day surrender of the war. RAF Tornado and Typhoon aircraft were particularly active over the past few days, bombing of three satellite dishes used by Libyan state television. "This strike was an attempt to disrupt the broadcast of Gaddafi's murderous rhetoric, which has repeatedly sought to incite violence against fellow Libyans," said the chief military spokesman at the Ministry of Defence, Major General Nick Pope. But British defence officials said the Nato campaign was likely to be scaled down during Ramadan, which started on Monday. They suggested that targets in Tripoli in particular would be avoided. The fall of Zlitan also poses problems for Gaddafi in finding new troops to hold the expanding front line around Misrata without drawing off other forces needed on the eastern front and in the Nafusa mountains to the west. Both fronts were reportedly quiet on Monday, the eastern front still disrupted by confusion caused by Thursday's murder of army commander Abdul Fatah Youness and the Nafusa brigades massing for an attack on the town of Tiji, 150 miles south west of Tripoli. The onset of Ramadan saw Misrata go into semi-hibernation, and residents are hoping the capture of Zlitan will finally put Gaddafi's rockets out of range of a city that has been under bombardment since March. France announced on Monday that it was releasing $259m (£159.14m) in frozen Libyan funds to the opposition and allowing the rebels' new ambassador to use the country's mothballed embassy in Paris. The French foreign ministry said the money frozen in French banks must be used for humanitarian purposes, in accordance with European law. The announcement came after the foreign finister, Alain Juppe, met Mansour Seyf al-Nasr, the Libyan opposition's ambassador to Paris.